Come and learn how to create your own Christmas gift with Cora! 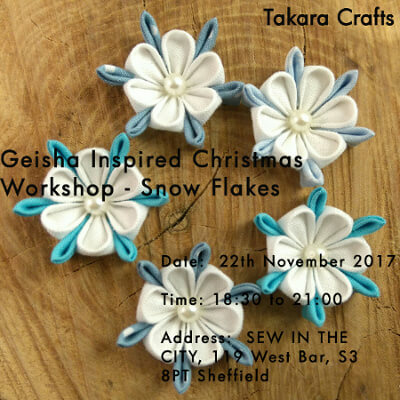 You will learn how to fold small pieces of fabric to create beautiful tiny flowers and decorations that can be used for jewellery, hair decorations or to trim and embellish clothes/ bags etc. A bit like origami with fabric, this is a unique, unusual but highly rewarding workshop that is ideal for anyone who loves making intricate delicate pieces and for those with an interest in learning the techniques with a view to creating larger, more theatrical pieces.